Are stocks on the verge of plunging? The S&P500 started Tuesday with modest gains, but the new Fed chief spooked the market when he hinted at four rate-hikes this year instead of the previously expected three. That was enough to send us into a tailspin that erased Monday’s breakout. Anyway, the market is fretting that things are too good. When is too good ever a problem? Well there is the inevitable excess that leads to the next economic contraction, aka a recession. But that is still a ways off because there are few claiming our economy is already overheated. In reality we are just starting to warm up following a prolonged period of lethargic growth. The Fed raising rates is simply us returning to historically normal levels and it is most definitely not yet approaching smothering levels. Most market participants agree with the above assessment and is why we shouldn’t expect Tuesday’s dip to go very far, especially since it follows February’s selloff. That plunge under 2,600 scared off most of the weak holders and they were replaced by confident dip-buyers. Out with the weak and in with the strong means we are standing of fairly stable ground. Conceivably we could slip as far as 2,700, but that is unlikely and would represent a dip buying opportunity, not a justification to sell reactively. It is not unusual to experience some downside volatility following the recent gains and lingering uncertainly. But market crashes are brutally quick and false bottoms last days, not weeks. 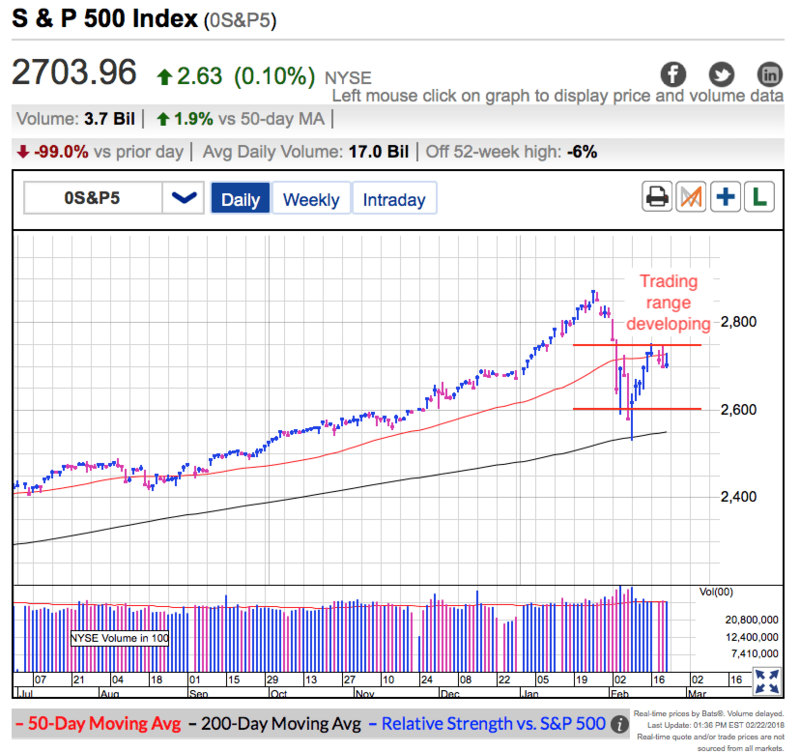 The fact the market held up so well the last few weeks tells us most owners still believe in this market and Tuesday’s headlines didn’t change that. These owners will keep holding and their confidence is keeping supply tight. If we were going to plunge further, it would have happened by now. Tuesday’s dip was much-ado-about-nothing and any near-term weakness is a dip-buying opportunity. As expected, Bitcoin slipped under $10k over the weekend, but the selloff failed to build momentum and we have since recovered above this psychologically significant support level. Runaway selling is taking a break because the weak hands have already been flushed out. Selloffs cannot get started when there is no one left to sell the dip. Things look good over the near-term the path of least resistance is higher. We will most likely break $13k and even push toward $14k over the next few weeks. But the thing to remember is BTC is still very much in a downtrend. While we can buy this rebound for a quick trade, this is most definitely not a good place to invest in BTC for the long-term. These rallies are to be sold, not held or chased. Lower-lows are still ahead of us and we haven’t seen the worst of this selloff yet. Bitcoin prices peaked at the end of 2013 and it took nearly two-years before the selloff and consolidation ended. Most likely it will be another six-months before BTC finally reaches a bottom. Until then expect lower-highs and lower-lows. Are we on the verge of another leg lower? The S&P500 started Thursday with healthy gains, unwinding all of Wednesday’s losses and then some. Unfortunately the buying didn’t last and prices slipped back near breakeven by the close. This is the fifth day the 50dma has been a ceiling for stocks. There were not any economic headlines to speak of and instead investors are still grappling with the ramifications of rising inflation and interest rates. Some people think these will smother a fragile economy. Other feel this is the economy finally returning to more normal levels following a prolonged stretch of lethargic growth. Count me as a member of the latter group. Even though inflation and interest rates have jumped a substantial amount, we are only approaching what used to be considered low rates during more normal times. Traders fretting the worst are fearing something that hasn’t shown its face yet. So far the economic data does not show any hints the economy is slowing down. These skeptical traders fear what “could” happen, but so far the data doesn’t support their concerns. Even though the fears that triggered February’s correction appear overblown, the large selloff brought the rally back to earth. A substantial amount of technical damage occurred and we shouldn’t expect prices to zoom back to the highs any time soon. As I was wrote last week, the rebound’s rate of gains was unsustainable and prices would likely stall at the 50dma. And so far that is exactly what happened. But it is not all bad. Even though we are struggling with 50dma resistance, holding these levels for five days shows support for prices. Prices tumble from overbought and unsustainable levels quickly and so far that hasn’t happened. That tells us the worst of February’s selloff is already behind us and we don’t need to fear another big selloff. That said, the selloff damaged sentiment and technicals enough that it will take time for traders to trust this market again. That means we will trade sideways for a while and consolidate the previous rally’s gains. This is normal and healthy behavior and there is nothing to fear. The thing to remember about sideways consolidations is they include moves in both directions. At times the market will look like it is breakout out. Other times is seems like it is breaking down. But these are just gyrations inside a trading range. Over the near-term, weakness should be bought and strength sold. Don’t be one of those people the market fools into buying high and selling low. Have the confidence and conviction to trade against these swings. As expected, Bitcoin’s surge to $12k stalled and pulled back. As I’ve been writing, the time to buy the dip is when everyone is scared and fearing the worst. Not after a rebound spread a sigh of relief through the crowd. Even though prices slipped back under the psychologically significant $10k level, the selling largely stalled and prices are not entering free-fall. Even though I think BTC’s worst days are still ahead of us, we are in the eye of the storm and prices will stabilize over the near-term. If we can hold $10k for another week or two, a follow-on rally up to $14k is not unreasonable. But since lower-lows are still ahead of us, any rallies should be sold, not chased. Previous crashes in BTC resulted in price declines greater than 80% and it took half a year or longer to finally bottom. Since we are only two months into this and only down 50%, we still have a ways to go. In the meantime, enjoy this brief reprieve and for the bravest of the brave, there might be a chance to buy the dip in a week or two. What’s coming next, new highs or new lows? After six days of gains, the S&P500 finally slipped into the red Tuesday. 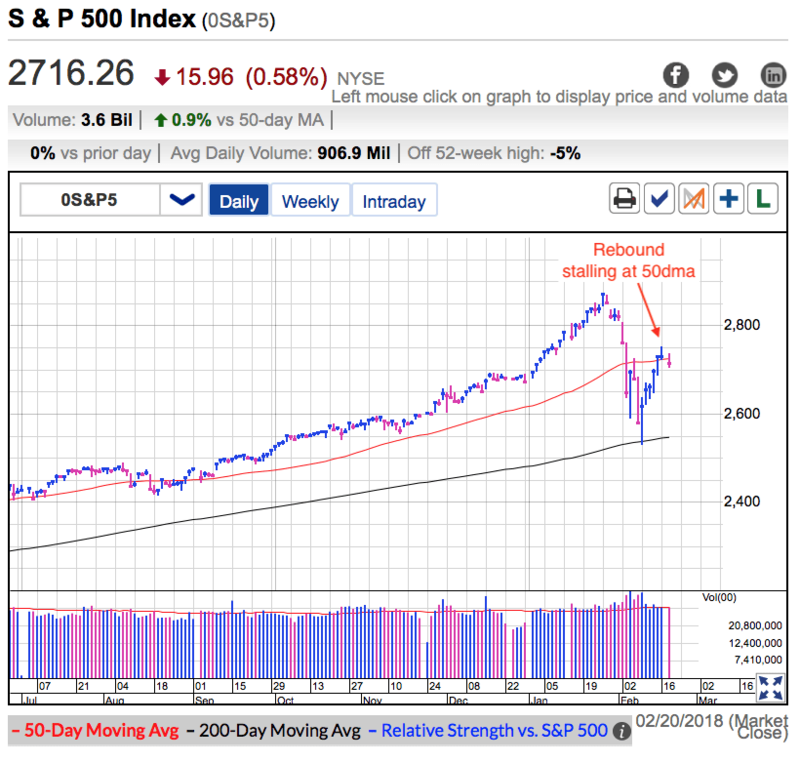 The size of the loss was insignificant when compared to last week’s rebound, but seeing the market bump its head on the 50dma was insightful, even if the pause was expected. Financial headlines continue to be benign and most traders are focused on the longer-term ramifications of rising interest rates and inflation. Fears over these items sparked February’s sharp selloff, but have since failed to extend the selloff. It seems most traders who fear higher interest rates and inflation already sold and were replaced by new owners willing to hold those risks. While the recent correction rattled investor nerves, it didn’t shatter confidence and most owners are confidently holding for higher prices. That said, February’s selloff was large enough that we cannot bounce back like nothing happened. Deep and emotional selloffs leave their scars and it takes a while for prices to build back to their previous levels. We recovered a huge chunk last week, but the rate of that rise was unsustainable and pausing at the 50dma is a normal and healthy thing to do. We put enough time and distance from the dip’s lows to say the early February selloff is over. Market crashes are breathtakingly quick and almost never include six consecutive up-days in the middle of the crash. Without a doubt we can undercut those lows, but it will take a new catalyst to kick off the another leg lower and it will be a new selloff, not an extension of February’s emotional selling. But just because the selloff is over doesn’t mean we are back in rally mode. We often see volatile trade during consolidations and base building. That means sharp rebounds followed by another round of selling. 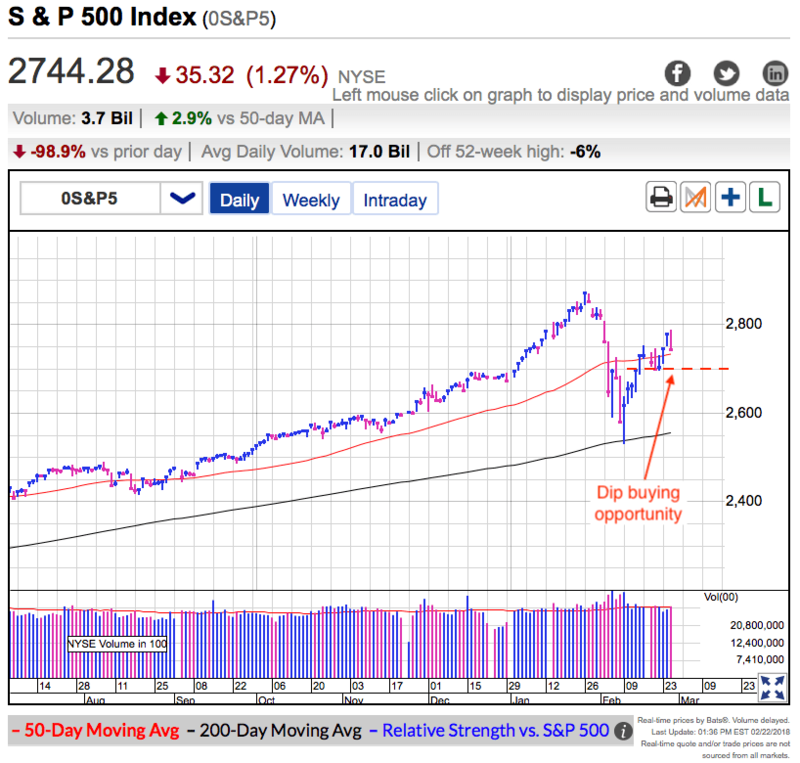 It wouldn’t be unusual or unexpected to see last week’s rebound stall at the 50dma and retreat back toward 2,600 support. Emotions are elevated and that means traders oscillate between believing everything is great to fearing the end of the world. This wide range of emotions leads to the bounces and dips that form traditional bases and consolidations. In range bound markets, it is best to trade against the market by buying weakness and selling strength. Don’t let the crowd’s emotions trick you into giving away money by buying high and selling low. This isn’t rocket science, we just need to be pay attention because the market keeps doing the same thing over and over. In January I warned readers the relentless rise in prices was unsustainable. After February’s 10% correction, I told readers the selling went too far and it was actually the safest time to buy in months. And after six consecutive up-days, I warned readers that we would stall at the 50dma. This isn’t hard if you know what to look for. And to answer the question in this post’s headline, neither. This is a range bound market we shouldn’t expect a strong directional move anytime soon. Bitcoin’s rebound continued over the weekend and got near $12k. Everything looks a lot better after a 100% bounce off of the lows. But that is what makes me nervous. The time to buy is when everyone is predicting a collapse, not when everyone is feeling better. This rebound took a lot of pressure off of BTC owners, but we will start running into overhead resistance. Many premature dip-buyers jumped in between $12k and $15k and we should expect many of those regretful owners to sell when they can get their money back. Their selling will slow the assent over the near-term. Over the medium-term, I question where the next round of BTC buyers will come from. This latest selloff burned new investors and scared off prospective investors. On the other end of the spectrum, BTC bulls bought everything they could during this dip and are now fully invested. Where does the new money come from? I cannot answer that question and is why I don’t believe the bottom has been put in yet. Previous BTC selloffs erased more than 80% of the value and took more than six months to complete. If we do the same this time, we won’t bottom until we fall under $4k and it won’t happen until sometime this summer or fall. Until further notice, BTC is still in a downtrend and that means bounces should be sold.